A structure or gland that secretes nectar, the sugar-rich substance that attracts pollinators and other feeders. A leaf that is much longer than wide, as in a sewing needle; usually refers to conifers. 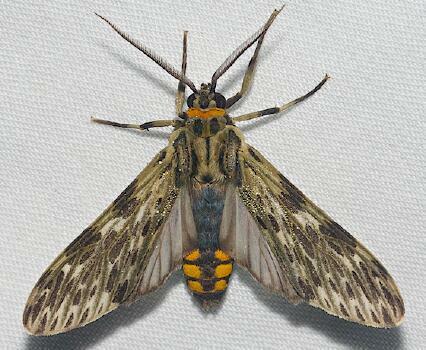 Little Carol's Wasp Moth, photo ©Carol Wolf, North American Moth Photographers Group. The raised or channeled portion of epidermis that indicates the path of a vein. With lateral veins that branch and reconnect, forming a network of anastomosing vessels. Point of attachment of a leaf, peduncle, or branch to a stem. 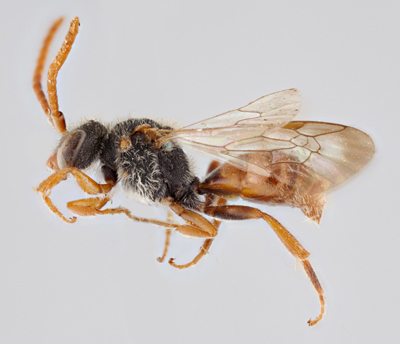 Nomad Bee, photo courtesy Packer Laboratory, York University with assistance of Robert and Cecily Bradshaw and Canadensys. Unusual condition in orchids where the lip is located on the upper side of the flower. A dry, indehiscent fruit with a hard wall, usually containing only one seed and usually subtended by an involucre (as in acorns of the oak family, Fagaceae).